Thanks for coming out on the super hot day to learn about Archimedes screw. Here is the write up. Thanks for coming, see you next month. 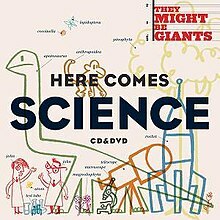 They Might Be Giants has a great album called Here Comes Science. The album touces on many areas and is a hit with our kids. Meet the elements, I'm a Paleontologist (also featured in a Payless Shoes ad! ), Roy G. Biv, and electric car. Lucas Miller has a great set of kids songs about biology and zoology. We will make our own Archimedes' screw! And learn about the famous mathematician and scientist from ancient Greece.